Experience a traditional Chinese water town on this half-day tour of Zhouzhuang from Shanghai. 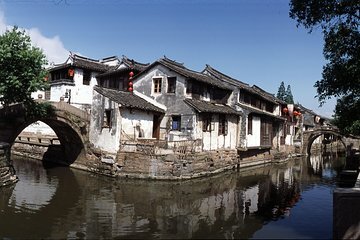 Admire historic landmarks such as Zhang Hall and Shen Hall on a walking tour of the ancient water village; shop for handicrafts including silk, Suzhou embroidery, and woven bamboo; and explore the maze-like canals on a boat cruise. Please arrive at the exact departure point you choose 20 minutes prior to the departure time. Please choose one of the departure point at time of booking and check the confirmation by the staff. Long transit times for a short, rushed visit. Site was interesting and tour guide was informative but did not appear to be very passionate. If you decide to do this prepare to spend 4 hours in a car and 1.5 hours at the site.